Those of us who were old enough to see Tron in the theaters in 1982 (I was two weeks short of turning 11-years-old), pretty much had our lives changed. Between that film and WarGames, we were pretty much all turned into fanatics for computers due to those movies. WarGames already got a direct-to-video sequel a while back (WarGames: Dark Code), but now Tron is getting a big budget, full sequel a whopping 28 years later. How will it look? The original film was cutting edge back in the day, so how will they update it so it keeps the look and feel while using modern graphics? Lets take a look. The new trailer gives us a pretty good idea of how the film is going to look and feel, and it's immediately obvious that the computer world feels a lot more "heavy" and "significant" this time. I chose to show the difference in the Recognizer ships as the Light Cycles have been shown just about everywhere already, and this change is so drastic that it is immediately obvious to what I mean. And while I didn't feel the need to show the Light Cycles, it is important to note that in the original film they could only make 90-degree turns, but in the footage we've seen, they can curve and swerve around obstacles. This is definitely a more advanced environment in the context of the film, and not just in what the special effects team could do. We catch glimpses of at least one new vehicle in the trailer that appears to be some form of Light Car, and its physics appear to mimic those of a real world car. What role it plays, or if it leaves a light streak behind it is unknown at this point. 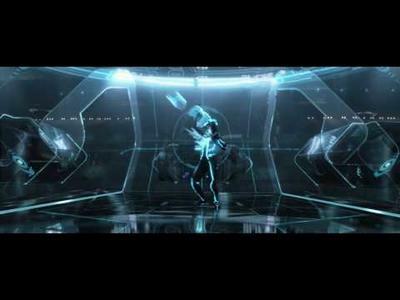 The battle suits, one of the most iconic items from the first movie get a major upgrade in Tron Legacy. As opposed to looking like bulky foam outfits with reflective tape on them, the new ones are sleek, skintight (at least in the case of Olivia Wilde's pictured below) and cut way back on the amount of light piping. It looks like this time the lighting is done on the actual costumes as opposed to being post-production work. In the context of the film, we saw in the first film the light piping was an indication of the programs life force — drinking from the energy stream made them brighter, they flashed with pain when being tortured — so there is no reason to think they indicate anything different this time. As for the real world technology we see, we learn that Flynn (Jeff Bridges) has been missing for 20 years, but yet he seems to have an advanced computer, even by today's standards hidden in the back room of the arcade. It appears to feature an on-screen keyboard, which if I remember correctly (it's been a few years since I watched the original) the CEO of ENCOM had something similar. Either way, still pretty advanced for Flynn disappearing 20 years ago. And, of course, the digitizer popping up behind Sam, Flynn's son, is straight out of the original film. How this technology works is still a complete mystery, but somehow it breaks down your form and digitizes it. Will we ever see something like it in the real world? Excuse me while I laugh … okay, done. Based just on this trailer, the movie will be another chance for us all to dream of what goes on inside of our computers. Well, we can at least dream this is what goes on inside of them. I like to imagine my MP3s are all files running around the digital world, perhaps all of The Ramones files are hanging out at some seedy club. Either way, December promises to be a good month for those of us who want to see what the digital world evolved into.